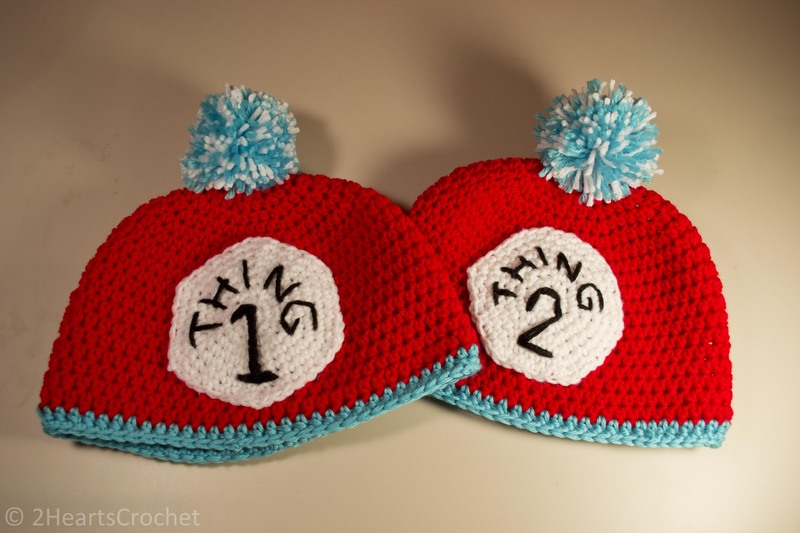 I know Dr. Seuss’ birthday was a while ago, but I’ve been so busy working on other projects that these adorable Thing 1 & Thing 2 hats only just got finished tonight. But they are darling! 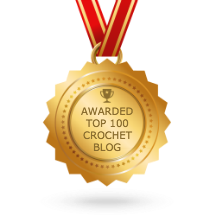 This pattern is available in sizes infant thru adult, so kids of all ages can jump in on the crochet fun! Rnd 1) In red, make a magic circle. Ch 2. Make 8 hdc inside the circle. Join to beginning of the round and ch 2. Rnd 2) 2 hdc in each st around. Join to beginning of the round and ch 2. Rnd 3) *2 hdc in first st, 1 hdc in next st* – repeat around. Join to beginning of the round and ch 2. Rnd 4) *2 hdc in first st, 1 hdc in each of the next 2 sts* – repeat around. Join to beginning of the round and ch 2. Rnd 5) *2 hdc in first st, 1 hdc in each of the next 3 sts* – repeat around. Join to beginning of the round and ch 2. Rnd 6-13) 1 hdc in each st around. Join to beginning of the round and ch 2. Rnd 14) 1 hdc in each st around. Join to beginning of the round, change to light blue and ch 2. Rnd 15) In light blue, 1 hdc in each st around. Join to the beginning of the round and ch 1. Rnd 16) 1 sc in each st around. Join to beginning of the round and fasten off. Weave in ends. Continue onto the small/medium white circle pattern (below)! Rnd 6) *2 hdc in first st, 1 hdc in each of the next 4 sts* – repeat around. Join to beginning of the round and ch 2. Rnd 7-16) 1 hdc in each st around. Join to beginning of the round and ch 2. Rnd 17) 1 hdc in each st around. Join to beginning of the round, change to light blue and ch 2. Rnd 18) In light blue, 1 hdc in each st around. Join to beginning of the round and ch 1. Rnd 19) 1 sc in each st around. Join to beginning of the round and fasten off. Weave in ends. Rnd 7) *2 hdc in first st, 1 hdc in each of the next 5 sts* – repeat four times. For the remainder of the round, make 1 hdc in each of the remaining sts. Join to beginning of the round and ch 2. Rnd 8-18) 1 hdc in each st around. Join to beginning of the round and ch 2. Rnd 19) 1 hdc in each st around. Join to beginning of the round, change to light blue and ch 2. Rnd 20) In light blue, 1 hdc in each st around. Join to beginning of the round and ch 1. Rnd 21) 1 sl st (loosely) in each st around. Join to beginning of the round and fasten off. Weave in ends. Rnd 7) *2 hdc in first st, 1 hdc in each of the next 5 sts* – repeat around. Join to beginning of the round and ch 2. Rnd 8-19) 1 hdc in each st around. Join to beginning of the round and ch 2. Rnd 20) 1 hdc in each st around. Join to beginning of the round, change to light blue and ch 2. Rnd 21) In light blue, 1 hdc in each st around. Join to beginning of the round and ch 1. Rnd 22) 1 sc in each st around. Join to beginning of the round and fasten off. Weave in ends. Rnd 8) *2 hdc in first st, 1 hdc in each of the next 6 sts* – repeat three times. For the remainder of the round, work 1 hdc into each of the remaining sts. Join to beginning of the round and ch 2. Rnd 9-19) 1 hdc in each st around. Join to beginning of the round and ch 2. Rnd 8) *2 hdc in first st, 1 hdc in each of the next 6 sts* – repeat two times. For the remainder of the round, work 1 hdc into each of the remaining sts. Join to beginning of the round and ch 2. Continue onto the large white circle pattern (below)! Rnd 8) *2 hdc in first st, 1 hdc in each of the next 6 sts* – repeat around. Join to beginning of the round and ch 2. Rnd 9) *2 hdc in first st, 1 hdc in each of the next 7 sts* – repeat two times. For the remainder of the round, work 1 hdc into each of the remaining sts. Join to beginning of the round and ch 2. Rnd 10-21) 1 hdc in each st around. Join to beginning of the round and ch 2. Rnd 22) 1 hdc in each st around. Join to beginning of the round, change to light blue and ch 2. Rnd 23) In light blue, 1 hdc in each st around. Join to beginning of the round and ch 1. Rnd 24) 1 sl st (loosely) in each st around. Join to beginning of the round and fasten off. Weave in ends. Rnd 9) *2 hdc in first st, 1 hdc in each of the next 7 sts* – repeat six times. For the remainder of the round, work 1 hdc into each of the remaining sts. Join to beginning of the round and ch 2. Rnd 10-22) 1 hdc in each st around. Join to beginning of the round and ch 2. Rnd 23) 1 hdc in each st around. Join to beginning of the round, change to light blue and ch 2. Rnd 24) 1 hdc in each st around. Join to beginning of the round and ch 1. Rnd 25) 1 sc in each st around. Join to beginning of the round and fasten off. Weave in ends. Rnd 9) *2 hdc in first st, 1 hdc in each of the next 7 sts* – repeat around. Join to beginning of the round and ch 2. Rnd 10) 2 hdc in first st, 1 hdc in each of the next 8 sts. Do not repeat. For the remainder of the round, work 1 hdc into each of the remaining sts. Join to beginning of the round and ch 2. Rnd 11-22) 1 hdc in each st around. Join to beginning of the round and ch 2. Rnd 24) In light blue, 1 hdc in each st around. Join to beginning of the round and ch 1. Rnd 10) *2 hdc in first st, 1 hdc in each of the next 8 sts* – repeat five times. For the remainder of the round, work 1 hdc into each of the remaining sts. Join to beginning of the round and ch 2. Rnd 11-23) 1 hdc in each st around. Join to beginning of the round and ch 2. Rnd 24) 1 hdc in each st around. Join to beginning of the round, change to light blue and ch 2. Rnd 25) In light blue, 1 hdc in each st around. Join to beginning of the round and ch 1. Rnd 26) 1 sc in each st around. Join to beginning of the round and fasten off. Weave in ends. Rnd 1) In white, make a magic circle. Ch 2. Make 6 hdc inside the circle. Join to beginning of the round and ch 2. Rnd 6) *2 hdc in first st, 1 hdc in each of the next 4 sts* – repeat around. Join to beginning of the round and fasten off, leaving a long tail. 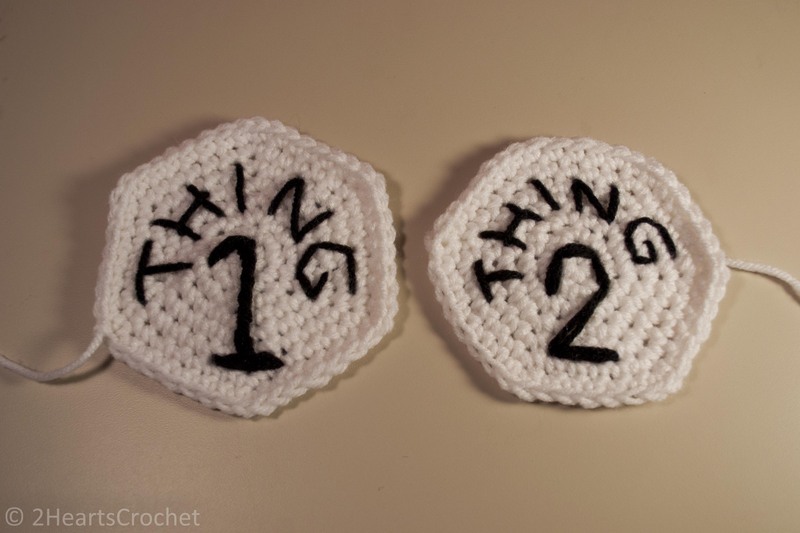 With a long strand of black yarn, use a tapestry needle to embroider the lettering for “Thing 1” or “Thing 2” onto the white circle. Then, using its long tail, use a tapestry needle to sew the circle onto the front of the hat. See photos for placement if necessary. Rnd 8) *2 hdc in first st, 1 hdc in each of the next 6 sts* – repeat around. Join to beginning of the round and fasten off, leaving a long tail. 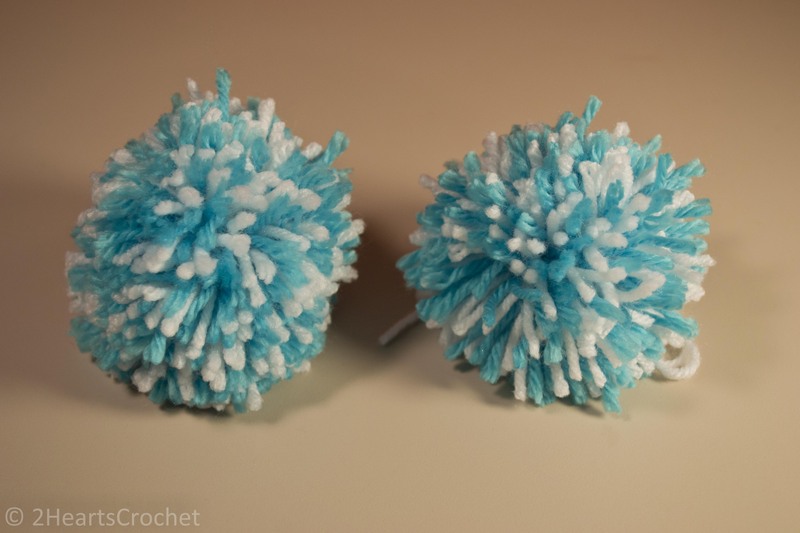 There are a large number of tips and tutorials on how to make a yarn pom pom. If you don’t know how, pop on over to Handimania and check out their fantastic pom-pom tutorial! For my pom-pom, I used a piece of cardboard roughly 6” long by 2” wide (I think this would be about the same size as using one empty toilet paper roll). Then all you have to do is assemble the pieces! 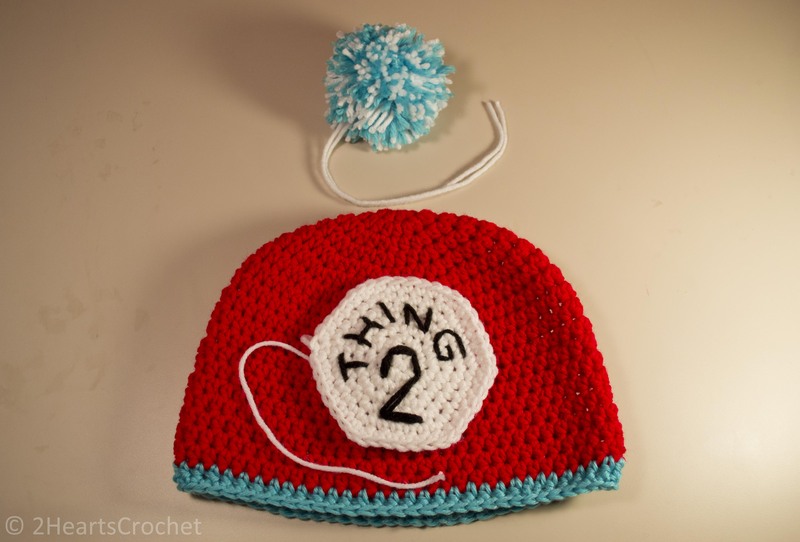 If you haven’t already, sew the “Thing 1/Thing 2” circle onto the hat. Sew the pom-pom onto the top of the hat. Weave in all of your ends. Ba-da-bing, ba-da-boom! 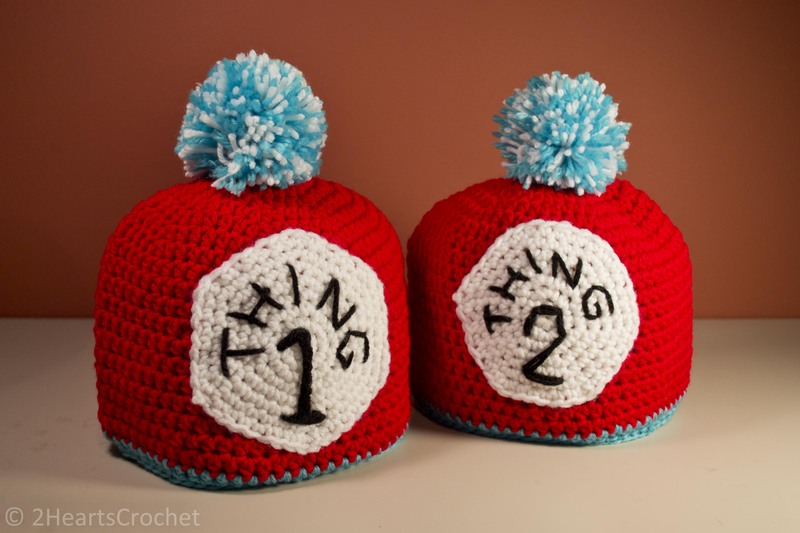 There’s Thing 1 and there’s Thing 2! I can’t wait to see my little brother and sister in these hats! 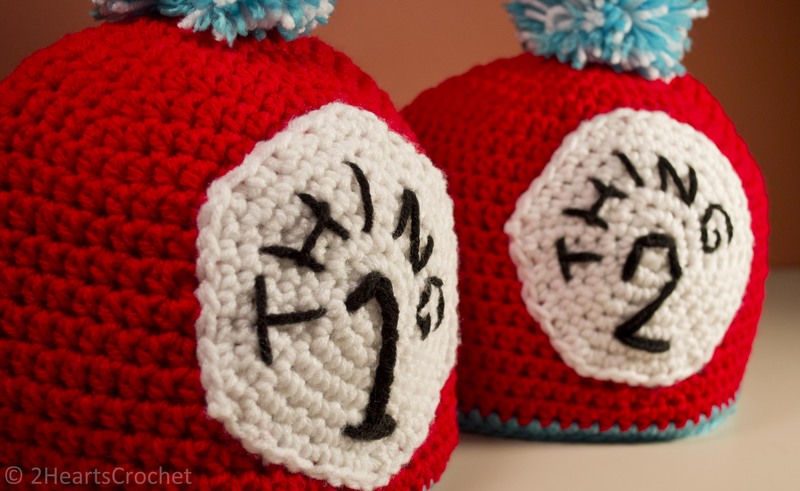 I would love to see your own Dr. Seuss-themed yarn creations! Please feel free to leave photos, comments and questions below or visit the “Contact Me” page to send me a note! 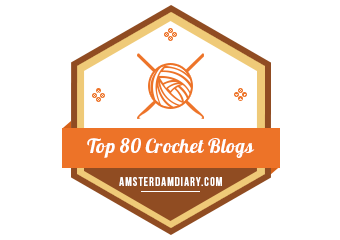 Previous post2HeartsCrochet is now Two Hearts Crochet!